Visited the National Trust property at Cotehele on 7th April. It was a cold and windy day and the daffodils were not yet out in all their glory. In fact there was not much blossom out anywhere. 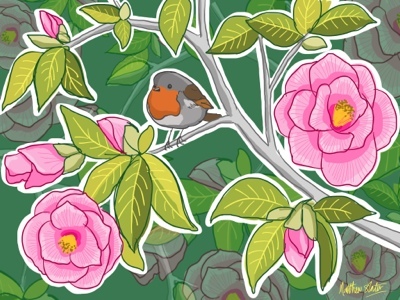 Some camellias looked colourful and while standing next to a bush about to draw some of the flowers a robin came and pottered around me. It was incredibly tame and was quite happy to sit on a branch barely a couple of feet away from me. I sketched the flowers and took photos of the robin and then completed the picture later in the evening. I wasn't quite sure how what style I was going to use and this was a bit of an experiment.